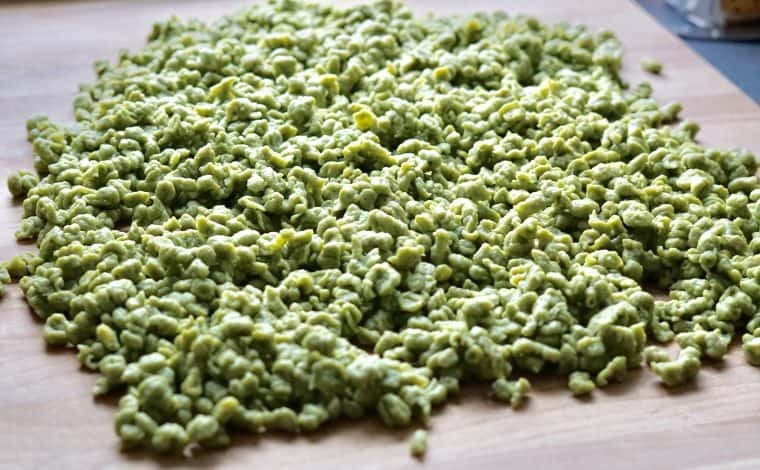 Wild garlic spelt-spaetzle - "Recipe from my Region, Classic & Vegan"
For the time being the last “recipe from my region” are the famous Swabian spaetzle/knoepfle. 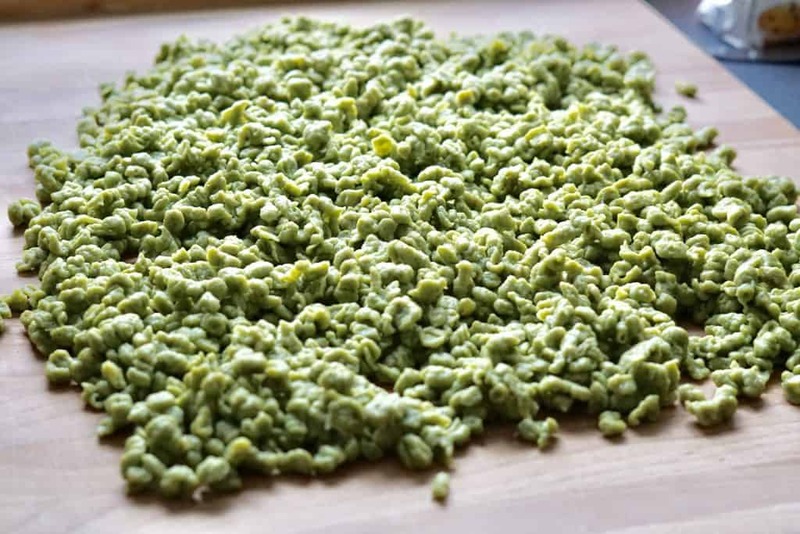 The Wild garlic spelt-spaetzle recipe is just another classic dish which was passed on from my great-grandmother to my grandmother, my mother and now to me. I modified the recipe a little bit and added some flavourful wild garlic which was picked close to our organic garden around Easter time. 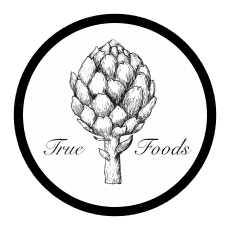 On our Webpage, you may find a Classical (egg containing) as well as a Vegan Version. The harvest season for this herb is short so that we further process the wild garlic to a pesto or freeze it for the rest of the year’s usage. You may use the wild garlic spaetzle as a main dish (with onions and cheese) or as a side dish with some vegetables and a creamy sauce. This is the perfect autumn/winter dish and gives lots of power and strength for the cold months. Enjoy a little Swabian/Bavarian history down on your plates, quick and easily made with only a few ingredients needed. What exactly are these Spaetzle/ Knoepfle? 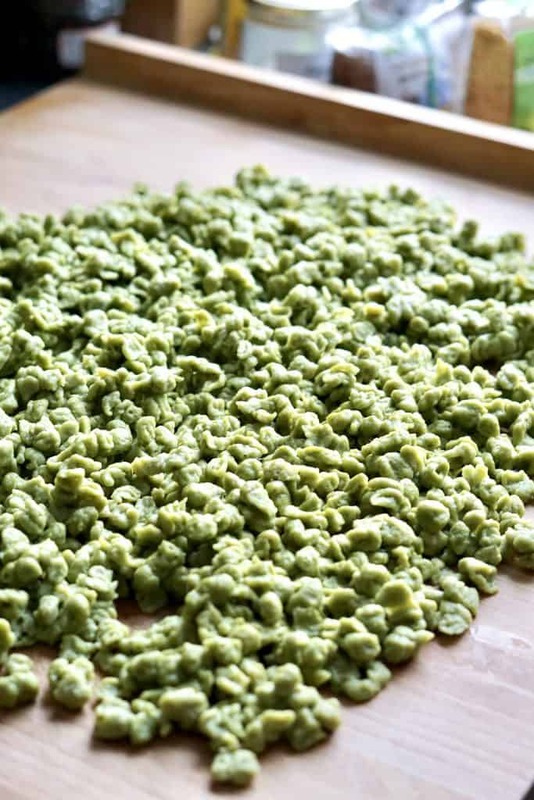 Spaetzle’s and their cousin Knoepfe are small pieces of dough cooked in simmering water. They can be little knobs or be thick and uniform almost like a thick spaghetti noodle. The ingredients are simple, flour, egg, water and are seasoned mostly with a bit of salt and nutmeg. You can add anything to your Spaetzle to make a meal. You never call a spaetzle a noodle to a Swabian. They say a Spaetzle must be 4 times in length its diameter and if it is in the button shape it is called Knoepfle ( just like in this recipe). Spaetzle is native to Germany but the same dish has different names in different countries, such as, Galuska, Chnophli, Halusky, and as it is made all over the world now the lines are blurred between what is a Spaetzle and what is something else. It is important to understand because it is really such a part of the Swabian culture and their heritage. The Swabians love their Spaetzle. Mix together the speltflour, salt, white pepper, and nutmeg. Beat eggs well, and add alternately with the milk to the dry ingredients. Add the Wild garlic pesto and mix well (with a wooden spoon) until smooth dough consistency. Let the dough rest for 15-20 minutes. Meanwhile, place a large pot on medium heat – simmering water with salt in it. 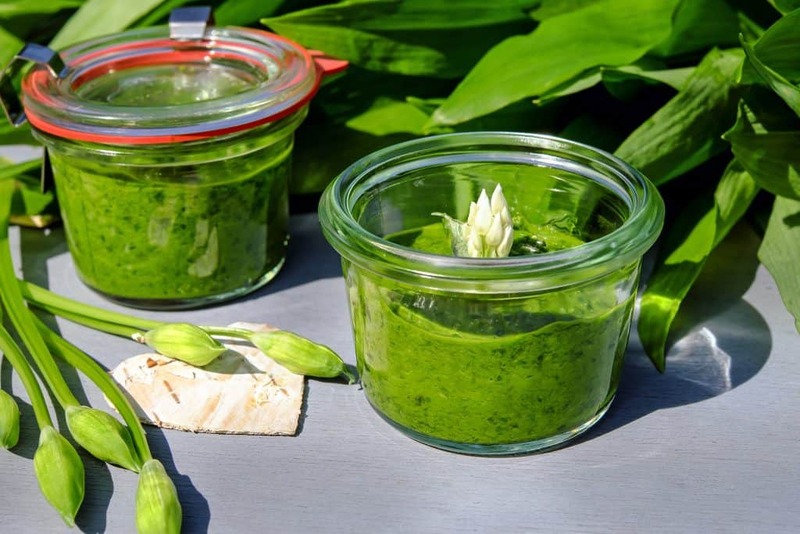 If you have the chance to harvest your own wild garlic around forest areas, mix the washed leaves with some oilve oil – add some salt, to have a well reserved pesto. 2. 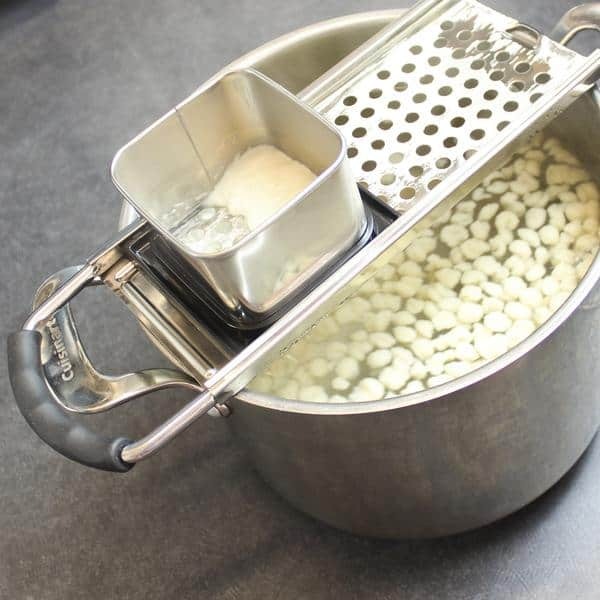 Press dough through spaetzle maker, or a large holed sieve or metal grater into the simmering water. 3. Drop a few at a time into the simmering salted water. Cook 5 to 8 minutes. Drain well. Do not add too many spaetzle/knoepfle at a time otherwise it will give a “dough mess” in your pot. Patience is needed at this stage. 4. After that, saute the cooked spaetzle in butter or Olive oil and serve with a sauce of your choice. If you want to pimp your Spaetzle to the famous Cheese – Spaetzle, just add some ground melting cheese of your choice to the saute pan in the last step (Emmentaler, Gauda, Cheddar …). Additional you may add some vegetable broth and cream to make the texture more creamy. Serve the Cheese Spaetzle with fried onions and some chopped parsley. Place the flour into a large bowl. Add water and Salt as well as the mashed avocado. Same procedure as in the Classic recipe for cooking the Spaetzle in simmering salt-water. Add 1 tablespoon of olive oil right before you start to press the dumplings into the water. After one or two minutes the dumplings will float to the top and you can transfer them to a colander. Top again with some homemade fried onions and chopped Parsley.